“Bad Soil” is no longer a septic problem when you make it "perc-rite!" You may have noticed in your own experiences that there are places where conventional septic systems will not work due to any of several reasons to include substandard soil that won't pass the perc-test. In some cases this has resulted in the belief that one could not build with a septic system. Due to modern advancements in septic technology, you can now build in most instances using an unconventional septic system in the form of a drip emitter system. A drip emitter system is a system that forces the liquid effluent (wastewater) through tubing with drip emitters and into the substandard soil in cases where the soil will not absorb the effluent. A little History, "Drip emitter systems have been around for about twenty years. They were developed in Israel as a means of reclaiming desert areas using fresh water to provide consistent distribution to water these areas evenly. Waste water drip systems used this even distribution method to keep the discharge below surface for proper treatment. We have several communities in the Atlanta, Georgia area that were able to be developed because of this technology. We even have a POTW (Publicly Owned Treatment Works) plant in Cherokee and Forsyth Counties, Georgia using this technology to dispose of their out flows in an environmentally safe manner." Don Wolf. Read the entire interview by clicking the link below. If any part of the following is confusing, you may find it useful to understand the septic system better by reading Septic 101 located near the end of this article. 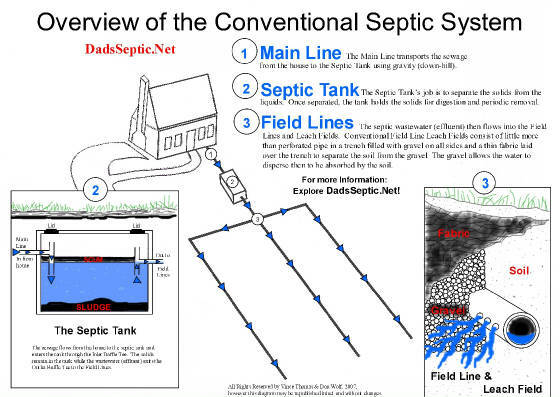 There the basic septic system is simplified and easy to understand. Many homeowners eventually have a problem with their field lines. Drip emitter systems can be an expensive way to solve field line problems but if your soil is the problem, then it may be the correct solution. Solving the septic problem and having piece of mind is also worth a great deal. Those with field line problems may find their solution by installing a drip emitter system. If properly installed by a professional, this can be a fast process and ensure the resolution of the problem. 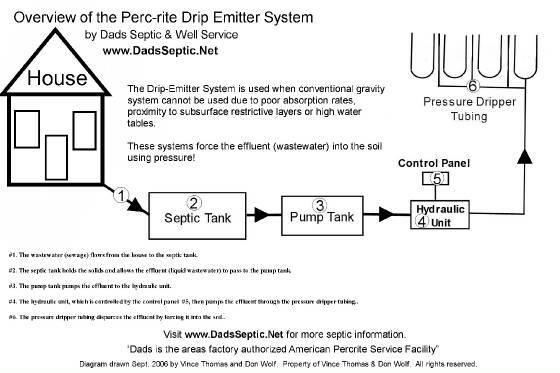 Purchasing a home with a problematic septic system can often be solved using a drip emitter system. Housing can be built on lots that couldn’t be developed. For example, desert land can be reclaimed as stated above. Onsite sewage treatment - is necessary when you operate outside the P.O.T.W. (Publicly Operated Treatment Works). This means that you need to treat your own sewage. In order understand how to do this one needs to understand how a septic system generally works. The Septic Tank's job is to separate the solids from the liquids. Once separated, the tank holds the solids for digestion periodic removal. Septic tanks are called "septic" because they work in an anaerobic state. The septic wastewater (effluent) drains or flows into the field lines. Conventional field lines are little more than a trench with gravel to allow the water to disperse and be absorbed by the soil. Field Line Problems - can develop due to the forming of a bio-mat. The bio-mat forms in the field lines where the anaerobic water makes contact with the aerobic soil. The majority of field line problems occur due to the bio-mat and the bio-mat problem can be easily prevented by adding an Aerobic Treatment Unit to your septic system. The Aerobic Treatment Unit adds air to the anaerobic effluent - turning the effluent aerobic so that it is more easily absorbed into the soil. This also prevents the forming of the bio-mat, which is the cause of most field line problems. Chamber Systems - The new technology of "chambers" replaces conventional field lines. Chambers allow bottom and side-wall exposure without the hindrance of aggregate fill. Mound Systems - are used when you need your field lines above ground in order to keep the proper distance from the water table. These lines are generally laid on top of the ground and covered with soil and appropriate landscaping. Peat Moss Systems - in place of conventional field lines, Peat Moss, contained in containers above or below ground, can be used to filter and disperse the effluent naturally. Please Note: All of the above systems require gravity. Drip Emitter Systems - are used when the conventional gravity system cannot be used due to poor absorption rates, proximity to subsurface restrictive layers or high water tables. These systems force the waste water into the soil using pressure! The Perc-Rite System is such a system and Dad's professionally installs and guarantees these and other engineered systems! Dad's offers a 5 Year No Failure Guarantee, which will further protect your investment. For more information, please contact Dad's today! Visit our website for more septic information! 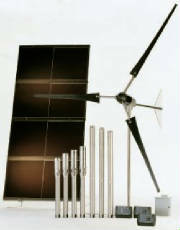 Perc Rite System service facility. All rights reserved by Don Wolf with the exception that anyone may republish this article intact, as use as content for their website, e-zine, etc., as long as the article & links remain attached and functional. The Majority of Septic System Problems today can now be solved by utilizing a new technology called Septic Remediation!"